A morning like any other was transformed in a single moment with the opening of a single email from Fraulein Frauke and John-Paul Bichard, producers of the Stockholm Burlesque Festival, asking me to join them overseas as one of their headlining performers. I literally started jumping on the bed! Yes, like a child. But I was filled with so much joy, honour and excitement it was hard to contain. This would be the makings of my first European adventure as a showgirl. The deep meaning of this opportunity that was causing my heart to race was only matched by the ridiculous pelvic thrusts I was physically enacting. 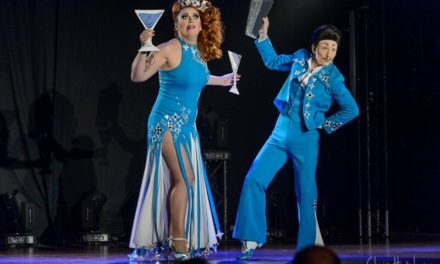 The Stockholm Burlesque Festival took place over one weekend, essentially Thursday to Sunday, starting with a pre-festival Meet & Greet and ending with a Casual Hangover Brunch. My time in Europe would last for one month and take me to four cities in three countries. I would land in Stockholm three times on my journey, take a total of sixteen airplanes and eat my weight in cheese. Thanks Europe! Headliners Lola Frost and Raven at the Stockholm Burlesque Festival 2015. Image copyright Jean Paul Bichard. Frauke and John-Paul were kind enough to open their home to me, not once, not twice, but thrice while I was on my journey. Each time was not only a haven and sanctuary, but an amazing way to get to know two people I can now call true friends and great inspirations to the burlesque community. Their contributions are diverse, selfless and many. Lola Frost at the Stockholm Burlesque Festival 2015. Image copyright Jean Paul Bichard. My first stay in Stockholm would only be for a day and a half before I flew to Hamburg, Germany to do three nights of shows with Sven Petersen at his lovely Queen Calavera. But that is another story for another day. When I arrived back to Sweden it was just in time for the festival! The Wednesday of my arrival back, I would accompany Frauke and JPB to Melt Bar, for a Burlesque Bingo fundraiser for the refugee crisis currently happening in Syria. The venue is a perfect 1920s cabaret, boasting a seamless blend of modern flare with nostalgic details that crushed my flapper heart not to be able to take it home with me. I would feel this way a lot on my trip about the venues I had the privilege of performing in. Back at chez Bichard, Armitage Shanks – co-headliner and Master of Ceremonies for the festival – joined us for the night before we were moved to Central Stockholm to our hotels for the weekend. This would unite us with the 3rd and 4th headliners – Bettie Blackheart (Finland) and Raven, (Berlin via Australia) as well as place us close to our two stunning venues, where we would be teaching and the after parties! I spent the day with my Canadian cuties Ariel Helvetica, Voracious Vee and Becky Page exploring Gamla Stan or Old Town and all it’s vintage beauty, truly a swoon at every turn. Thursday evenings Meet & Greet was casual and quiet, a nice mellow start to the perfect whirlwind that the full weekend in bloom would bring. Seeing new faces I would get to know more and hugging a few friends I love deeply was perfect. Venue: Södra Teatern – The oldest theater in Stockholm built in 1859. I started the day by visiting the currency exchange, not really something worth talking about except my true excitement to be in Stockholm and to be changing Euros into Krona was not missed by the teller, who I then gave a flyer for the festival, who then found me on Instagram and who then thanked me for my positive energy and smile that day. What fun, thanks internet! Fraulein Frauke at the Stockholm Burlesque Festival 2015. Image copyright Jean Paul Bichard. Tech and make-up, the eating of Thai food. Being at the venue for most of the afternoon into the evening is what I enjoy about festival showcases. The building of energy among performers, little previews of acts, learning the theaters nooks… This VENUE! Mind blowing on every level, I felt effortlessly transported back in time. The houses view of the stage, our view of the audience, the bars and lounges within the theater itself, the VIEW from the dressing rooms and the Champagne Lounge upstairs were all breathtaking. You can see clear over most of the city from up there. The show was seamless and incredibly well curated. Frauke and John-Paul certainly know style, quality, diversity and talent. I was able to watch the entire first set and my face hurt from smiling. I was genuinely entertained and delighted! I loved seeing all different styles of burlesque and vaudeville represented side by side and at such a high caliber. The sold out audience was alive and vivacious, devouring every performance morsel we tossed to them. Frauke would tell me later they have been building this audience for years and have a loyal and appreciative following, a fact I don’t take lightly as I understand greatly the importance of not only building your performance community, but those who support it. It was palpable that the couple have succeeded in this. I skipped the after party as I was teaching a two hour workshop in the morning and like to rise early to prepare at a leisurely pace. But I heard it was a most smashing affair! Venue: Nalen Klubb – or as I like to call it, The Golden Ballroom. Built in 1888. Up at early o’clock, coffee, breakfast (the hotel laid out quite the spread all European style) and reviewing my notes for class. The workshops were conveniently held at Nalen, in the ‘small ballroom’, you know I had a laugh at this, as the grandeur was not lost on me. A full and powerful class of 22 students was so energizing and impactful. It never ceases to amazing me the energy created in classes, the vulnerability transformed into creativity was thick that day! I had enough time to head back to the hotel, snack, change, pack and be back for tech. Again, watching the stage be set up among the stunning opulence of the venue was making my heart pound. The night’s, and the weekend’s energy was building up furiously to a head of yet another sold out night! I’m pretty sure the room was twice the size of the previous night’s venue, and to my surprise it was all standing room. I was beginning to understand why in Europe they have “Burlesque Klubds” and not just “Shows”. The audience and vibe is an integral part of a good night, a Klubb ensures the crowd is part of the night not just observers, and they all did it up right! Dressed to the nines and ready to party, cheer and throw-down love, and love they did. Bettie Blackheart at the Stockholm Burlesque Festival 2015. Image copyright Jean Paul Bichard. A unique addition Frauke and John-Paul add to the launch of the evening is the annual OcBOOBerfest a tassel twirling contest of pomp and pageantry for a good cause (The Swedish Pink Ribbon Foundation). This year I was a ‘celebrity’ guest judge along side the stunning Duo RAW and Epiphany Get Paid! I’ve never felt so short as my heeled 6″ self. For REAL! What gorgeous creatures to be among. The aim of the contest? Last two tassels twirling of course! Prizes for Best Technique, Best Costume and Last One Standing were given at the end of the rounds. The show unfolded in another array of diverse and exceptional talent, I was able to catch some of the first set once again and was in awe of Armitage and his unique blend of lowbrow humour and perfect poetry all in the key of his signature ferocious growl. There are far too many people and acts to mention, everyone I was able to see thrilled me, everyone I heard about from others who got to catch an act or came back panting from a job well done lit me up. It’s that feeling you get when you know everyone is in their flow. Being backstage is a glorious place, one of sanctuary and preparation, of excitement and bustle and most of all connection and support. This festival was no different, the chatter was positive and giddy throughout the nights and I could feel new and old friendships taking form and coming to life. It’s really essential and special for a festival to create a space for that. With the nights being so well run and organized it really reflects on the quality of energy the performers and audience take on. It was a big win in that component. The bubbles and snacks helped too. Each night ended with Bettie, Raven and I as closers and what a treat to be able to watch these powerhouses blow the roof off the joint! I very much appreciated our differences in style and execution, but could not help notice the consistency of overt fierceness – dark and decedent vixens we be. The icing on the burly cake was a full cast curtain call, a popping of glorious streamers into the air, the gushing words of appreciation and an acknowledgment of a job well done by all. Tonight, oh tonight, I was going to the after party. It was held at WONK a fabulous and notorious Gay Klubb where Drag thrived and the dance party always got dirty. John-Paul was on fire all weekend with his photographic ways, hauling his kits all over the city to capture the magic. He shot not only the shows, but the backstage and the after parties as well. Another beautiful quality about this team of Frauke and JPB was their uncanny ability to have everlasting energy and presence. Not once did I see their spirit drop or energy levels falter. Although they had a good team in place for help, being DIY all-hands-in-the-pot producers, they sure got my respect for their turnaround on communications, media and setups. And always, you can trust, with a smile. Raven at the Stockholm Burlesque Festival 2015. Image copyright Jean Paul Bichard. The after party was lush and sweaty, a proper ol’ grind down dance floor good time. Apparently I made the mistake of wearing tights under my shorts (as Autumn had started to show it’s bite in the air) because once I saw the venue had poles, those tights were being cut off by my own fingernails so I could climb them and do tricks. You can take her out, you can dress her up, but know she’ll want to climb things! Raven, his husband and I all made our way back to the hotel before sunrise… but only just. Venue: Chez Bichard. Fact – Frauke’s sister was still up as I was going to bed, baking for the brunch. Now that’s love. The ‘casual’ brunch was hosted in the home of the festival producers. Let me repeat myself – the casual brunch was hosted in the home of the festival producers. A bold and thoughtful move I could not help but note. After producing a weekend like that, I myself might be curled up in a ball somewhere wanting someone to serve me tea and rub my feet while Netflicks lapped something funny in the background. But not these two, they opened their space to any of the performers who could make it, fed us and poured lovely drinks into our waiting cups. I must admit, though it seemed like it might have been work, it was a perfect reflection in a quiet space to come down together from the stupendous, successful and stellar weekend. Once everyone had cleared out and the food was put way, we napped, oh and we napped hard! The cast of the Stockholm Burlesque Festival 2015. Image copyright Jean Paul Bichard. I would go back to the Stockholm Festival in a heartbeat, in fact I’m already eyeing up Europe for 2016 hoping to participate again in conjunction with another tour. It’s flawlessly run, joyful, elegant and inclusive. It represented what a festival should contain in all ways. I can’t thank the Bichard duo enough for bringing me on and presenting me with such a wonderful opportunity to be part of the legacy they are creating on Stockholm, I was truly proud and honoured to be a part of something so authentic and integral. I stayed a few extra days to explore the city in some down time and was fortunate to have their home to stay at. I took a private pole lesson with an amazing Russian instructor, I walked the waterline with Duchess (from the Amazing Knicker Kittens, original founder of the festival in 2010) and toured the museum island.at leisure. We shared many great meals and conversations, some great laughs, took some lovely photos, and most of all – formed a connection that was inspiring. Do yourself a favour, apply, and plan a trip in early October to gorgeous city of Stockholm. The Stockholm Burlesque Festival 2016 runs 7-8 October.